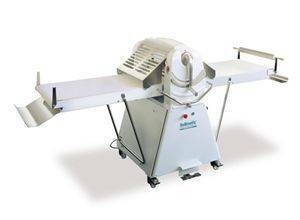 Rollmatic´s best-selling manual sheeter, it stands out due to its unrivalled quality. Removable folding tables for easy belt replacement. Rocker arm and pedal lamination reversal. Optional second speed and cutting set. Stainless steel protection grid with safety microswitch and gas piston lifting system. Increased capacity and high performance with the best value for money.